So in my last post I wrote about the amazing KoKyu short rib quesadillas. They were so good that they inspired us to make quesadillas for dinner on Saturday night. 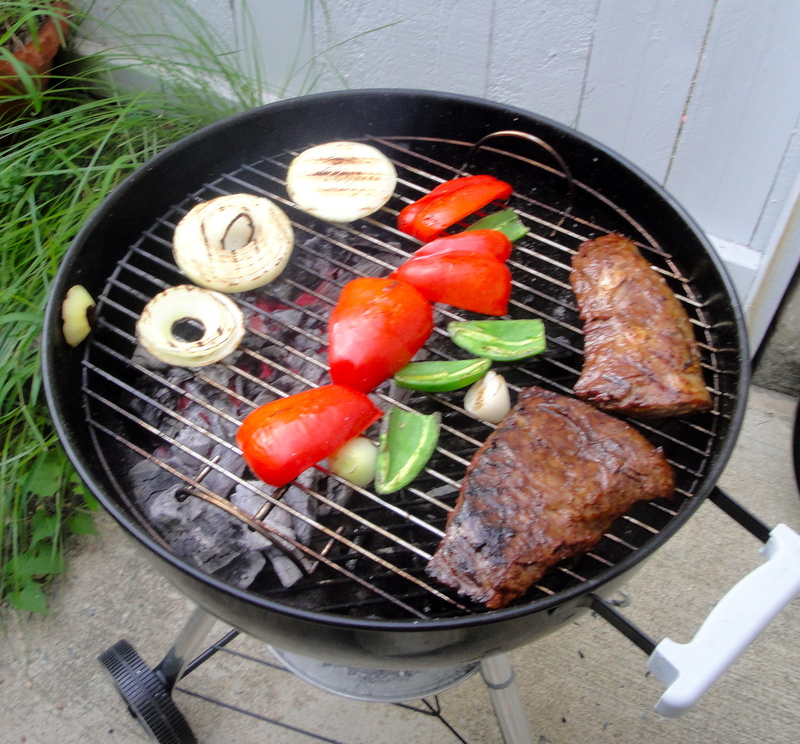 We grilled up some flank steaks, made a filling of grilled onions, peppers, mushrooms and jalapenos, and stuffed the whole thing with plenty of grated Mexican-blend cheese. Those are the flank steaks on the grill, Jon picked them up from the Carrboro Farmer’s Market. I made a Mexican-style marinade with soy sauce (works like a charm in terms of adding salt! ), oregano, lime, sugar, cumin and some oil and let the steaks sit in it for a few hours. Jon cooked the flank steaks perfectly: they were so tender and pink on the inside. 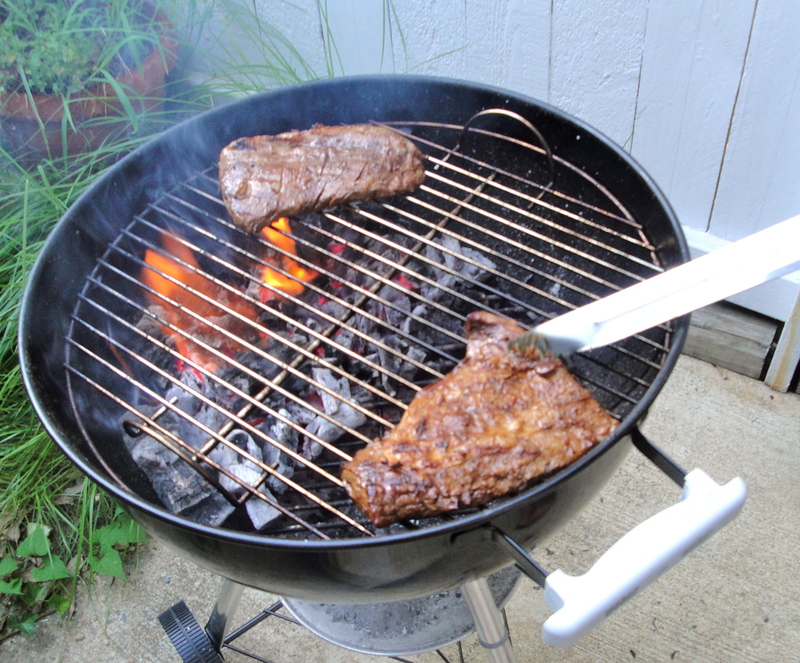 We had a good guide in the Food Lab’s How to Grill a Flank Steak over at SeriousEats. That’s the flank steak with the grilled vegetables for the quesadilla filling. Quesadilla fillings! 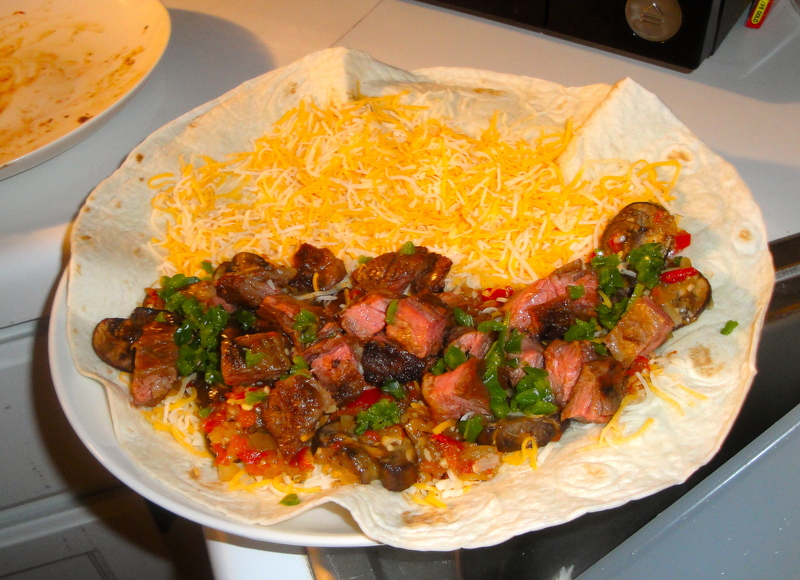 Cheese, flank steak, peppers, onions and jalapenos! Now here’s the fun part. 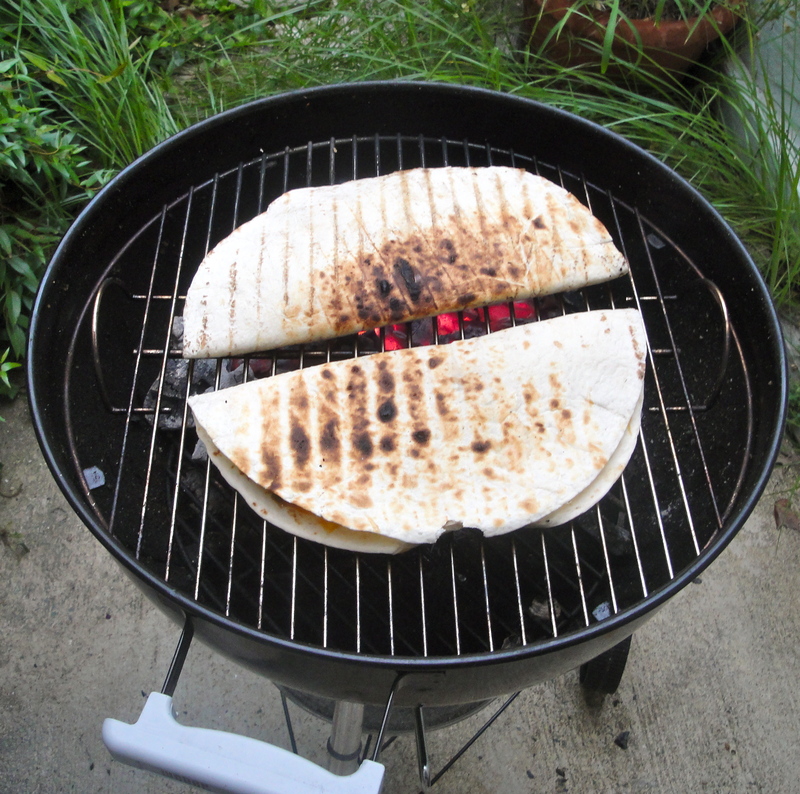 We decided that, once the quesadillas were assembled, we’d throw them right back on the grill to get that crispy, smokey finish on the outside of the tortilla. This worked perfectly. Look at that char! Perfect. The grill was such a great summer investment. The last few summers I’ve lived in an apartment with no outdoor space, which is a bummer when reading amazing seasonal summer recipes that extol the glories of the grill. Now I can make all the fantastic, summery dishes about which I’ve read. Grill victory! And yes, the quesadillas were delicious. I’m salivating right now. Now I know what I’m going to do with the flank steak we have in the freezer. Yum! They were delicious! Jon’s gotten really skilled with the little Webber!